Giselle Makhan: Mind your language, kids!!! One of my 4th grade students pointed this to me today. "Not me," he said. I realized it must have been from the previous class that I had. "What is it in English?" I asked. He look at his friend and just said, "Bad word." 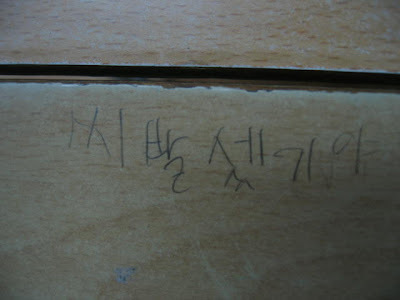 So I took a pic of it & asked my Korean friend what it meant. ...written by a 3rd grader!